If you've been following my blog for awhile, you'll know that I started it with predominantly DIY tutorials. Although I don't get to do it as often anymore, it is still my first love and that is precisely why I didn't pass up the chance to have fun with a pair of Bensimon sneakers during the DIY event held yesterday at the newly opened CommonThread boutique in Power Plant Mall. DIY events are rare but they always prove to be loads of fun. You just don't get to show off your creativity but it is also often a laidback and casual experience. A chance to get to know a product's potential while catching up with friends over snacks. Yesterday was no exception when they converted the Common Thread store into a a pseudo art school complete with long picnic tables loaded with all kinds of art materials and staff from Craft Manila to supervise the stylish guests. Most were either bleaching or embellishing with glitter and colored paint. You all know that I'm not really much into color and I wanted something unique yet wearable so I decided to stick to my usual palette of black and white + marry Bensimon's philosphy of being "Perfectly Imperfect" into my design. 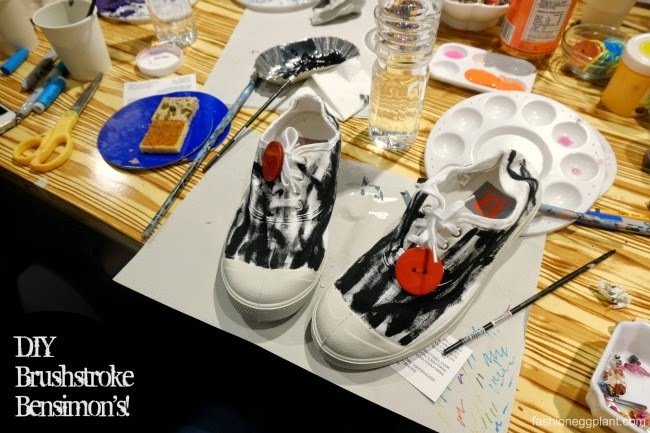 This is what I came up with...a perfectly imperfect brushstroke designed shoe. Just like me, it grows on you (ha-ha). And I love how literally perfectly imperfect it is. The process is easy. 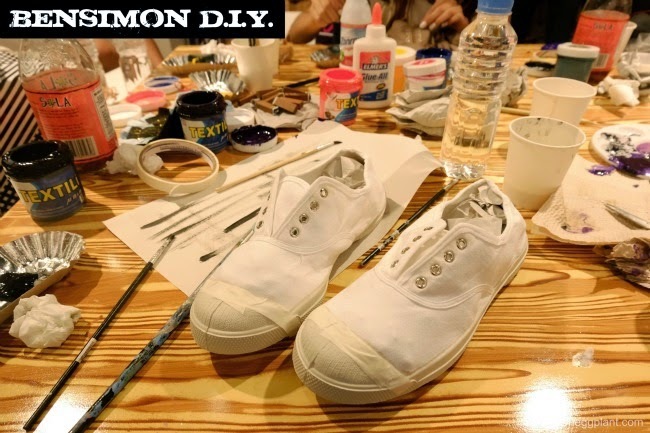 Pick up a dry brush, dip in paint, shed off excess of scrap paper, dry brush your shoe, let dry. Make your own or watch out for new designs of Bensimon Sneakers in the upcoming months at all CommonThread Boutiques (greenbelt 5, power plant mall), Rustans (gateway, makati, alabang, shangrila), Center Of GRavity (burgos circle, bgc and centris), Shoe Salon (glorietta 3, power plant mall, shangrila, trinoma), shoe thing (bgc, eastwood, greenbelt 5).